American hedge fund manager, philanthropist, and environmentalist Thomas " Tom" Steyer has mounted a $20 million campaign to remove Trump from office. Steyer is the single largest donor to the Democratic Party, having donated over $66 million during the 2016 election cycle. He and his wife signed The Giving Pledge, which is a commitment to donate half of their fortune to charity during their lifetimes. 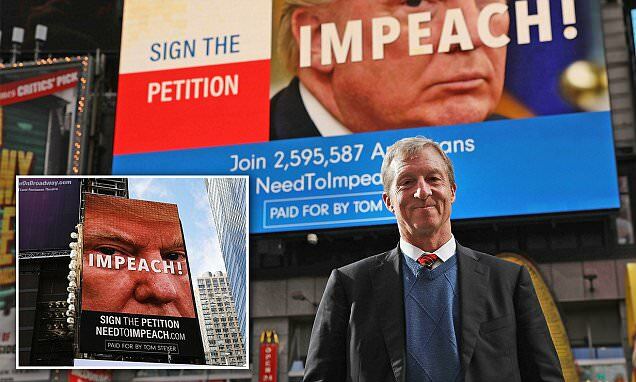 Steyer said, "We're putting a couple of large billboards in Times Square calling for the impeachment of the president...We legitimately feel that this is the huge issue in front of the American people that no one is standing up for what the overwhelming number of Americans think," according to Newsweek. More than 350,000 people go through Times Square daily. The billboards direct people to Steyer's website, where they can sign a petition calling on Congress to impeach. Trump would be the third president to be impeached. The goal is to make him the first president to be impeached and removed from office. Steyer started his petition a month ago. At the time of this writing, it is closing in on 3 million signatories. This is not a time for "patience" -- Donald Trump is not fit for office. It is evident that there is zero reason to believe "he can be a good president." Whether by the nature of Mr. Trump's relationship with Vladimir Putin and Russia, his willingness to exploit the office of the Presidency for his personal gain and treat the government like a family enterprise, his conduct during Charlottesville, his decision to pull out of the Paris climate accords, or his seeming determination to take the nation to war, he has violated the Constitution, the office of the Presidency, and the trust of the public. He is a clear and present danger to the United States of America. Republican Senator Bob Corker, Chair of the Senate Foreign Relations Committee, referred to the Trump White House as a day care center, and observed that this president has put us "on the path to World War III." This comes following reports that Trump's own Secretary of State referred to him as a "moron" and that Chief of Staff John Kelly and Secretary of Defense James Mattis have an agreement not to leave Trump home alone for fear of what he could do. And we have seen other Republican Senators, including Senators Sasse and Flake, express their own profound concerns. An accounting of his record to date leads to the same conclusion. He is turning his back on Lady Liberty by holding immigrant children hostage. He is actively sabotaging the Affordable Care Act -- a law he is constitutionally obligated to faithfully execute -- while seeking to strip away health care coverage that will leave millions of Americans to choose between life and bankruptcy. He is repealing clean air protections and unleashing polluters, even as increasingly catastrophic natural disasters supercharged by our warming planet ravaged the country throughout the summer -- from hurricanes Harvey, Irma, and Maria, to the wildfires that have raged across California, Oregon, Washington, Idaho, and Montana. He has threatened to reduce aid for millions of American citizens in Puerto Rico who are struggling to survive without drinkable water or electricity -- a move that would be a total dereliction of his duty. And every day, Americans are left bracing for a Twitter screed that could set off a nuclear war. These actions represent systemic attacks on our nation's future. They endanger every single one of your constituents. That's why you have a duty to speak out. There is no moral reason to remain silent about this. Constitutional experts like Noah Feldman have already laid out clear legal and historical foundations for impeachment. Founding Father Alexander Hamilton, a co-author of the Federalist Papers -- and an immigrant himself -- argued that "high crimes and misdemeanors" could be defined as "abuse or violation of some public trust." This president has clearly already exceeded these standards. Congress has impeached past presidents for far less. While we know that Republicans do not seem prepared to pursue impeachment even as members in their own ranks openly question Trump's fitness for office, we are all working hard to ensure Democrats will take back the House and Senate in 2018. View All 2 Articles in "Tom Steyer"